This category 24" wide computer desks. This is the most popular compact computer desks size. Do to the narrow size, many include a mouse tray. 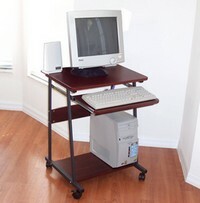 These 24 inch wide computer tables are very popular, since these carts will fit easily next to a table or even at a corner as a a corner desk. They are a good solution for small bedrooms, a home-office, any small office, medical exam rooms, dorms, etc. Below, you will also see Stand up computer workstations, as well as our space-saving pole computer carts, also used as sit to stand computer desks. All our compact desks are portable. Same Day Shipping. Delivery in 3 - 5 business days, via FEDEX Ground.